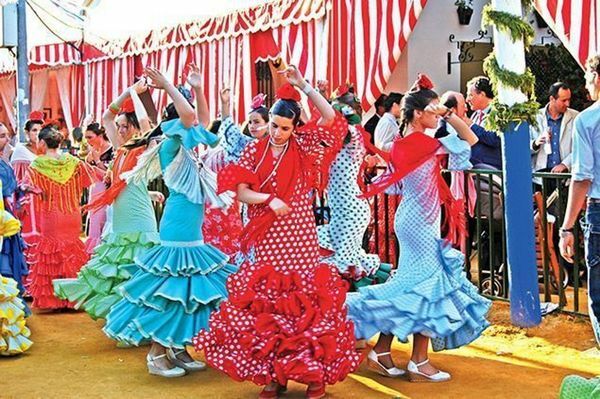 If you are planning a trip to the eastern end of the Costa del Sol you will be spoilt for choice when it comes to festivals and ferias throughout the region. Nerja is one of the most scenic towns on the eastern end of the Costa del Sol. Nerja is home to the scenic ‘Balcon de Europa’ – a stunning balcony with breath-taking sea views. Nerja is also known for its annual feria which brings the town to life and takes place from October 8 to 12 each year. One of the latest ferias of the year to be held on the Costa del Sol, the Nerja event is held in honour of Our Lady of Sorrows and the St.Michael the Archangel. Processions, flamenco dancing, singing, folklore performances, decorated carriages, and colourful festivities take place on each day of the feria. A festival of fun, fireworks, eating and drinking for all the family. Fairground sideshows and attractions occupy the central part of the feria ground and around the sides you will find ‘casitas’, large marquees, where various organisations stage all sorts of activities, including the election of the ‘Feria Queen’. Rincon de la Victoria is situated just 12km east of Malaga and offers a choice of annual events and festivals. On the second Sunday in September, Rincon de la Victoria hosts the annual Festival de la Boqueron (Anchovy Festival), during which thousands of kilos of anchovies are cooked and enjoyed by locals and visitors. Other local specialities are also on offer, accompanied by live Verdiales folk music. A food competition also takes place between young chefs who must feature the Rincon de Victoria anchovy as the star ingredient of their dishes! Free tastings and children’s activities are also included. Rincon also incorporates the fishing village of La Cala del Moral and the inland village of Benagalbon, part of the scenic routes of the raisin and the avocado. Usually held over the first weekend of July, Torre del Mar’s Weekend Beach Festival is fast becoming one of the most popular events on the eastern end of the Costa del Sol. Held on the Playa de Poniente, the Festival has put itself firmly on the ‘Spanish Summer Festival Map.’ Previous line-ups have included the best current Spanish bands and a choice of leading international DJ’s. The location is unbeatable and extra activities include a welcome party, daytime concerts and competitions. Prodigy, Paco Osuna, Nada Surf and Estopa have performed at the Torre del Mar Weekend Beach Festival, attracting party-goers from all over Europe and beyond. If you are planning a holiday or longer stay on the eastern Costa del Sol, take a look at the vast choice of festivals, ferias and local events taking place before you travel. Whatever time of year you plan to visit, you will find a vast wealth of attractions and events in this part of the Costa del Sol.